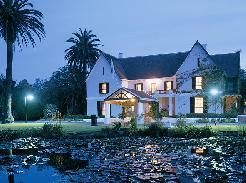 Knysna Hollow is beautifully set on a secluded old country estate near Knysna's famous lagoon. 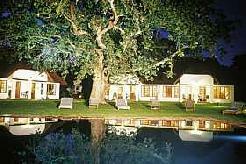 Set amongst timeless oaks and pecan trees, the gracious old manor house forms the focal point of the lodge. 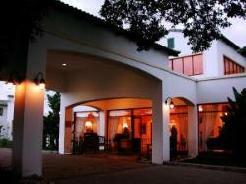 Built in a bygone era, it is finished with pressed ceilings, yellowwood floors and indigenous furniture. 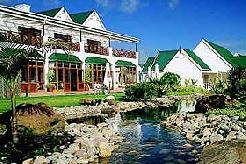 Knysna Hollow is an excellent value for money choice when golfing on the Garden Route at either of the Pezula, Simola, Goose Valley or Plettenberg Bay golf courses. 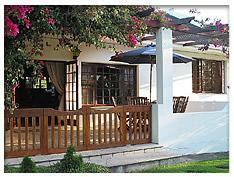 Accommodation on the Estate consists of 15 garden chalets and 49 garden rooms. 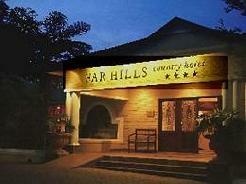 Amenities in all chalets and rooms include television, tea and coffee-making facilities and private patios. 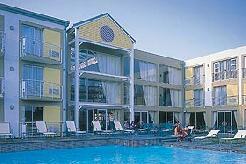 The rooms and chalets have been tastefully decorated with a Knysna forest feel. The comfortably appointed chalets include telephones, ceiling fans, and a fireplace for all those romantic winter evenings. 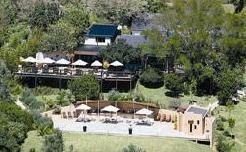 The Knysna Hollow a-la-carte Restaurant is situated in the Manor House and serves fine food in relaxed and warm surroundings. The scintillating, yet refined menu reflects flavours and influences from around the globe, with a selection of dishes sure to stimulate the senses. Choose between ocean-fresh seafood such as Cape Crayfish and linefish, South African specialties such as Karoo Lamb and Venison dishes or decadent desserts. You can enjoy pre-dinner drinks next to a roaring fire in wintertime or in the yellowwood-panelled pub, "The Rutland Arms". As an alternate venue to the a la carte restaurant, The Pecan Tree Grill Room's menu includes both classic Malay-inspired dishes such as Spicy Malay Lamb Curry as well as local specialties like fresh Knysna Oysters. Fresh ingredients, rich flavour and genuine hospitality make for an unforgettable dining experience in a relaxed and unpretentious atmosphere. The restaurants have an extensive wine list that features some excellent Cape wines as well as a broad selection of after dinner drinks including ports, liqueurs and brandies. Service is warm and friendly and the hand-picked wine list is sure to contain the perfect Cape wine to complement your meal. Visit the nearby picturesque historical town, with it's antique shops, African and local arts and crafts and coffee shops. Featherbed Nature Reserve is only a short ferry trip across the lagoon, and a walking trail through here is a must. Ride on the famous steam train along the coast through breathtaking scenery.